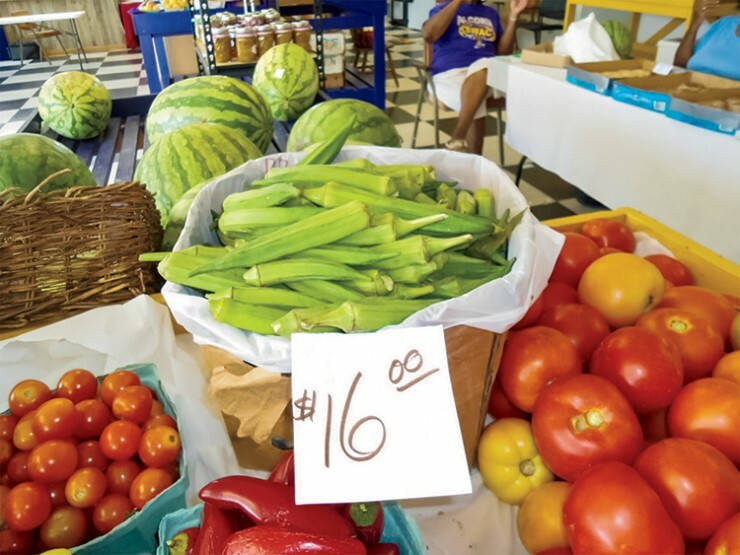 Mississippi’s 82 farmers markets, which are spread across the state, all sell fresh offerings and support the Hospitality State’s hardworking farmers. The Natchez Farmers Market, one of the 36 farmers markets certified by the Mississippi Department of Agriculture and Commerce (MDAC), is unique because it is a partnership between the Alcorn State University Extension Service, the city of Natchez and Adams County officials. As part of Alcorn’s Outreach Centers, the Natchez Farmers Market operates as an educational venue. “We offer a lot of events that are held as a means of educating and engaging adults, farmers, vendors, youth and college students, such as educational awareness, food safety and Extension Awareness Day,” says Helen Brooks, market manager and employee of Alcorn State Extension Service. “Our main goals are to provide healthy food choices to the customers, serve as a profitable marketplace for small producers and serve as an economic driver for southwest Mississippi by increasing tourism,” she adds. Another engaging aspect of the market is its participation in the Senior Farmers Market Nutrition Program. This initiative, administered by MDAC, provides more access to good nutrition and healthy foods for low-income senior citizens in certain areas of the state. “Specially printed checks are provided on a one-time basis to participants above the age of 60 and receiving services from the Area Agency on Aging in certain communities where farmers markets are present,” says Brooks. “This allows vendors to reach an audience that would otherwise not purchase at the farmers market. Even being on a fixed income, some seniors do return and purchase after they’ve used their vouchers.” The nutrition program for seniors is just one of the innovative changes the market is making. Brooks says in the future, the market hopes to have green areas with raised beds accessible to wheelchair-bound individuals, a children’s garden and a test kitchen for local clients. “We just want to continue to do what we do, and make sure we address the demands of the county and surrounding areas,” she says.